High quality and Great Value Fabric Matte Projector Screen. Durable Matt Surface diffuses projector light uniformly providing perfect visual enjoyment with optimal image and color reproduction. Adhesive for Easy installation and disassembling. Can be used in various areas such as classrooms, conference rooms, home theater, and so on. Spot Clean (Do not use Abrasive Solvents). 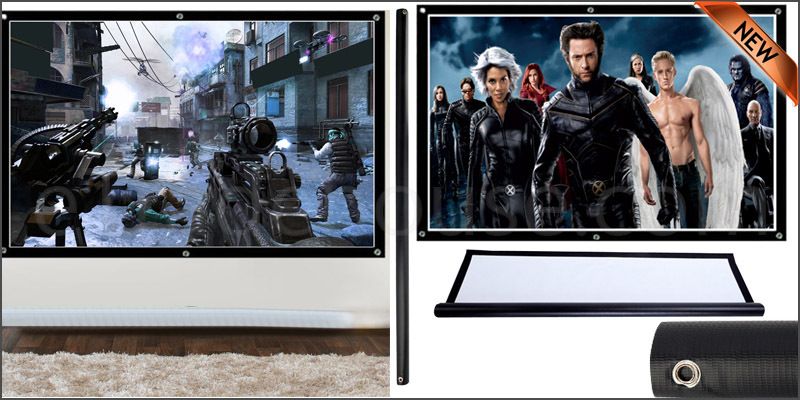 Projector Screen Horizontal Size: 100 inches (approx.). Projector Screen Vertical Size: 50 inches(approx.). Screen Area: 87 x 49 Inches (approx.). Colour: Black Edges with White Screen. Item Packing Dimensions: 131 x 6 x 6cm. 1x 100 Inch 16:9 Fabric Matte Projection Screen.